I was thinking, this weekend, whether there would be any logic or clear order to this countdown. Whether it would just be, say, memes, or episodes of shows, or funny little things I found on the internet like a Battlestar Galactica toaster (get it? It’ll be a future post, of course). So anyhow I realize that, no, there won’t be any logic. Some posts will be about My Little Ponys, and some posts will be about what is arguably the most important graphic novel–no, one of the most important literary achievements–of the 20th century: Alan Moore’s Watchmen. The inspiration for this post was actually brought about by HBO’s showing of the movie which was, I must say, a huge disappointment. The film was too literal in its adaptation of the comic and, because it was too literal, it was too superficial. The film was all flash, no substance, and a number of the roles were horribly miscast (Laurie, Adrian Veight, etc.) I thought Billy Crudup was great, and Patrick Wilson was great, and Jackie Earle Hayley as Rorschach was great. Also, all the flashback scenes involving the Minutemen; those were beautiful. Overall, however, the film was a failure. But how could it not be a failure when the graphic novel is such a monumental masterpiece? 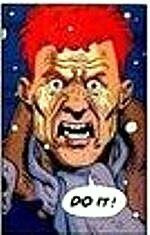 The first time I read Watchmen my mind was blown. I like my graphic novels heavy and this was heavy–and beautiful, and so true, and filled with such portraits of psychological detail. The inclusion of primary documents from earlier eras was brilliant, and wonderfully fleshed out the edges of the story without boring the reader with too much exposition. And, honestly, the action, and the ridiculous alien squid, that is not what stayed with me–the characters felt so alarmingly present, tangible, and real, and they have never left me since the day I closed the cover. Especially Dr. Manhattan. He was all-powerful, but so lonely, and I thought Jon Osterman’s backstory was utter brilliance. An atomic man was so impossible, and yet, perhaps not. And this is why speculative fiction is the best of all possible fictions. Also, a blue man alone, on the red planet. So simple. So beautiful. 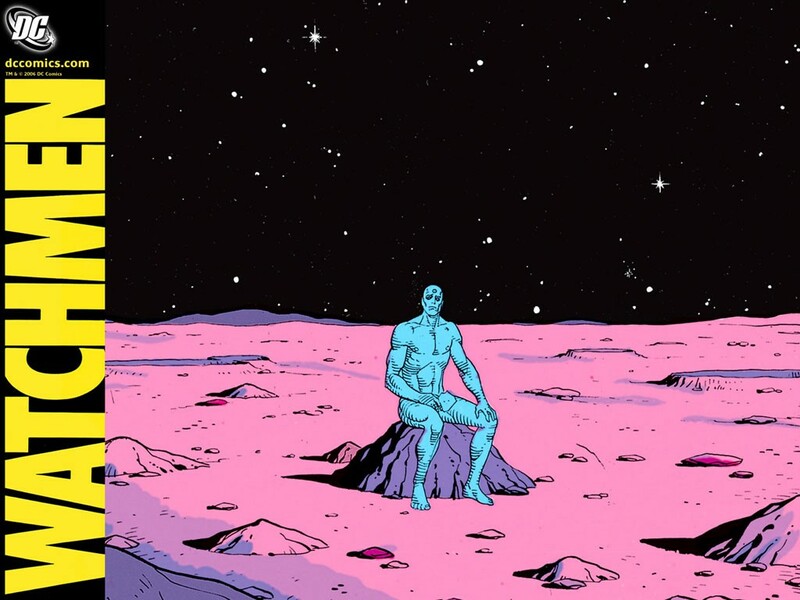 The second time I read Watchmen I was able to see how masterfully the story and the art were melded, how Alan Moore had found the perfect vessel for his words int he art of Dave Gibbons. Also, I was more able to fully appreciate the Black Freighter’s role in the story. 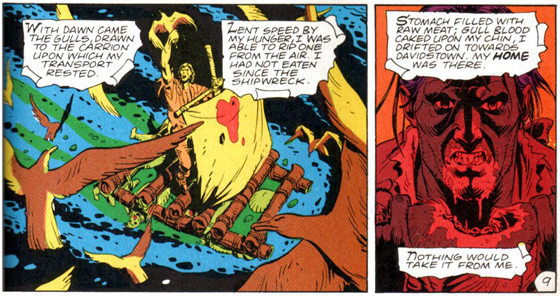 The Black Freighter, the comic read by a minor character in the graphic novel, is woven seamlessly into Watchmen’s visual and thematic narrative. I remember, for instance, gasping with surprised when an image of the protagonist of The Black Freighter eating a raw seagull was immediately followed by a nearly identical picture of Dan eating a chicken leg. Little visual cues like that are scattered throughout the graphic novel, and it is wondrous to discover them. And, of course, I was able to once again appreciate these wonderful, three-dimensional, flawed superheroes. Once again, they seared themselves into my memory. Childish Laurie, sad and nostalgia Dan, delusional Adrian, lonely Jon, the misunderstood Eddie, and, of course, the unyielding and infallible Rorschach, who remained himself until the end, until he could no longer live with the truth of the world. Pure, tragic, perfection. Allright, so, I’m not sure what else to say. Sometimes, this countdown will be gushy, because so many creations in the sci-fi/fantasy/graphic novel genre had such a huge impact on how I view the world. 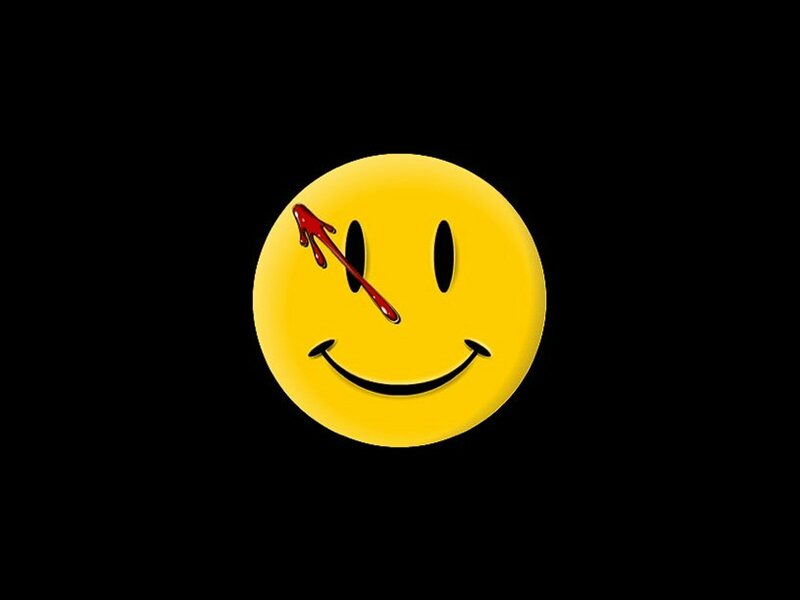 So if you haven’t read Watchmen, please do. And if you have, then you understand why I need to gush quite so much.